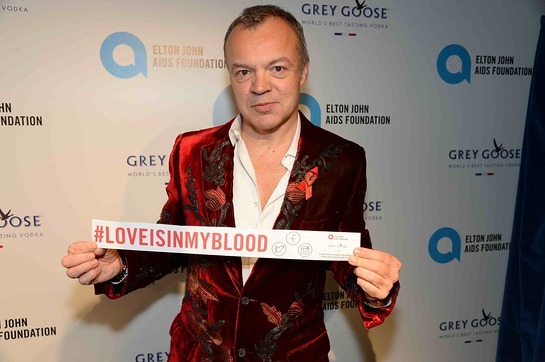 On Saturday 30 November, television host Graham Norton hosted The Love is in My Blood Winter Dinner at the GREY GOOSE Fly Beyond Bar, on Shaftesbury Avenue in London, to benefit the Elton John AIDS Foundation. The focus of the evening was to support the charity’s ‘Early Testing Saves Lives’ message via a call to action for guests and the public at large to show compassion for all people who are HIV+ and to eradicate the stigma surrounding HIV testing. “Some people have HIV in their blood, everyone has love in their blood,” commented Graham Norton. Guests at The Love is in My Blood Winter Dinner were invited to add their support to the campaign, by tweeting ‘selfies’ of themselves with ‘Love is in My Blood’ banners and hearts. “We hope to encourage a mass public tweet on Sunday 1 December to spread our compassionate message – ‘Love is in My Blood’. To date we have been joined by many celebrity supporters including Ai Weiwei, Ben Cohen, Alan Carr, David Walliams & Lara Stone, Plan B, Elizabeth Hurley, Stephen Fry, Sting & Trudie Styler, Ed Sheeran, Florence Welch and many more," explained David Furnish, co-founder of the Elton John AIDS Foundation. The intimate dinner for 100 guests, including Julian Macdonald, Melissa Odabash, Ben de Lisi and Isabella Christensen, featured a banquet of fine food and, of course, a collection of GREY GOOSE Fly Beyond cocktails. Cabaret act Le Gateau Chocolat and DJ Paul Harris of ‘Dirty Vegas’ fame entertained guests post dinner. The GREY GOOSE Fly Beyond Bar was a temporary venue created by GREY GOOSE to celebrate the vision of Francois Thibault, the maître de chai who flew beyond the norm to create ‘a vodka with taste in France’. “Grey Goose has supported the Elton John AIDS Foundation for over 8 years and has raised in excess of 2.5 million pounds for the charity. This money has helped to build much needed homes for families with AIDs in Cambodia, as well as introducing a groundbreaking online support network in the UK and helping make other projects possible. Many sectors shy away from HIV. Grey Goose has the creativity, love and courage to see beyond the horizon to a future where we have beaten AIDS. We are very grateful for their support of the ‘Early Testing Saves Lives’ campaign,” said David Furnish. “The Elton John AIDS Foundation and Grey Goose share the same belief that the world will be a better place if you fly beyond the norm. Along the way there will be opposition, but with passion or compassion this can be overcome to achieve an AIDs free future,” commented Natasha Curtin, Grey Goose Global Brand Director.